I start to feel weird, and kind of painful and stuff”. At 32, he’s still at the top of his game. 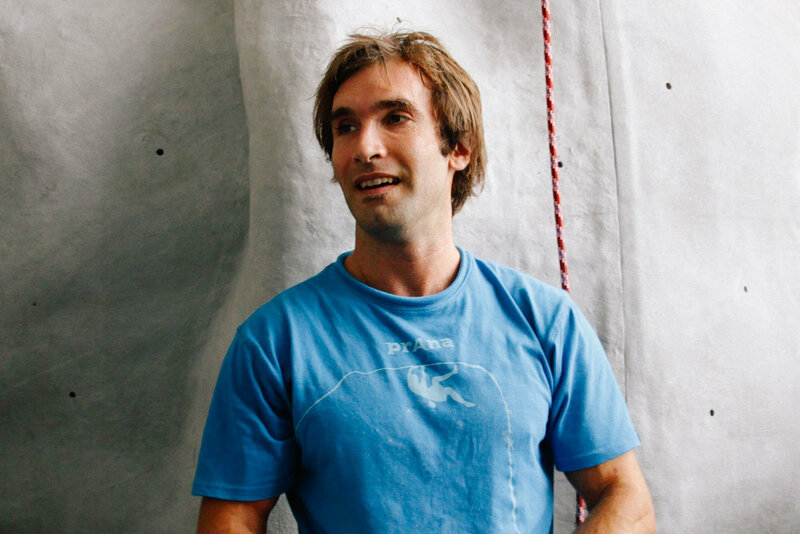 chris sharma: When you start something so young, it’s natural that you have ups and downs. I’ve never been a very disciplined athlete. I think I have a lot of natural talent, and it’s just been really fun for me. There were moments when I didn’t want to do it, and I actually didn’t climb for months. It’s impossible to be 100 percent motivated all the time, but because I always listened to my heart, my motivation always came back—and 10 times stronger every time. cs: Climbing gives me focus and direction. It just feels so good to move on the wall. The movement is just so beautiful, and every route is unique: you have different styles of climbing for each one. It’s an interesting balance between the mental and the physical. The mastery of your body—when your brain tells your body to do something and your body does exactly what you want it to do—is a really incredible sensation. esq: what’s your favourite aspect of rock climbing? cs: Doing first ascents and developing new routes. Like when you discover a blank cliff that looks barely possible and you have to use your imagination to create a line up the wall. That’s when climbing crosses over from being a sport and into an art form. esq: what happens after you’ve conquered a climb? thing. There’s always going to be the next route, something harder, someone else stronger; but it’s your personal experience that matters. One of the really beautiful things about climbing is that, whether you’re a beginner climbing a 6a or a pro climbing a9b+, it’s a similar process. It’s finding that something you’re not sure you’re capable of and working really hard at it, which forces you to open your mind and follow through to reach your goal. esq: after 17 years at the top of the sport, do you feel pressured by other people’s expectations?cs: There’s some expectation, for sure, but I’ve based my whole climbing philosophy and style not so much on being the best. It’s more about the lifestyle, about how you do it. There are different ways of appreciating the sport, and being really good is just a side effect. I’ve done enough in my career to prove myself, so I don’t feel so much pressure anymore. I’m just more excited to climb for myself, and I’m still climbing better than ever. esq: do you worry about competition from new climbers?cs: Of course you have competition, but usually, you’re competing against yourself and against the climb that you’re trying. The competition with other people is a man-made thing because, if you’re thinking too much about being better than somebody else, you’re not going to be focused on what you’re doing. It’s not like when you play tennis, and you’re trying to beat somebody. esq: why should people get into rock climbing? cs: It’s really good exercise—you work almost every muscle in your body, but it’s not like going to the gym and doing 100 repetitions. What’s really creative about it is the mental side of problem solving. Every route is different, and you have to unlock the code for each climb. It’s just a really fun way to get in shape, and it’s really social too. The coolest thing about it, though, is that it’s like a life journey. You can be five years old or 65 years old, and still be climbing. It’s possible to progress your whole life. It’s not like other sports, where the goal is to go to the Olympics and then retire when you’re 25 or 30. With climbing, even when you’re not the best anymore, you can still enjoy it because it’s a lifestyle sport. It's an Indian name. My mother and my father were yogis in an ashram in California. And when they were married they took the name "Sharma". Climbing is my passion. It's something that gives me direction in my life. I started climbing in 1993, when I was 12 years old. My mother took me to a climbing gym, and that’s where it all started for me. It was something she thought I would like, and it was love at first sight. For 20 years I’ve just been really passionate about climbing. It’s become my life. I never really trained, but I always have to work really hard to achieve my goals. Some people have a really structured training program where they know what time they’re gonna wake up, what they’re gonna eat, and all that. And this works for some people, but my style is to just go climbing. Some people, maybe they don’t call this training—they just call it climbing. It just feels so good to move on the wall. The movement is just so beautiful, and every route is unique: you have different styles of climbing for each one. It's an interesting balance between the mental and the physical. The mastery of your body—when your brain tells you to do something and your body does exactly what you want it to do—is a really incredible sensation. A lot of people have inspired me over the years. Now I'm 32 and there's a couple of young climbers who are really pushing the level. This is the cool thing about climbing: there's this history and somehow we’re all connected to it. Right now, I'm in this role where I'm still at the top, climbing my hardest, but somehow connecting the past generation with the future generation. And it's been really cool to see the evolution of the sport. It's finally getting so popular and there's more recognition and it's helping the younger climbers push themselves. I had a lot of success and I did a lot of hard routes. I climbed the first 9b+ in the world. And somehow this became a little bit boring because... I dont know. I felt I had done everything I wanted to do in climbing. So I was about 22 yrs old and I was thinking, 'Well, what else should I do?' And I was thinking maybe it’s a good time to do something else with my life, go back to school or something, or just change... At the same time, I was finding out about deep water soloing, in Mallorca. This was the coolest thing. I'd never realised that this was an actual possibility. I never made the connection that you could climb with no ropes over the ocean. It was amazing, especially for me, coming from Santa Cruz by the ocean. When I started to get into climbing I was always going into the mountains, and deep water soloing is like bringing the two things together. It’s so free. This totally revolutionised my appreciation for climbing and renovated my passion for the sport. Twenty metres up, no ropes, and the ocean below you. I’ve developed this deep connection with Spain and Mallorca. I learnt how to speak Spanish and really started to feel at home in Spain. I had been travelling for about ten years, just living out of my backpack and going to different countries to climb, and I was a bit tired of that and I wanted to find a home base and also a place where I could actually develop my climbing more—because it's actually difficult when you’re always travelling to be very focused. To really be your best you need to have a stable atmosphere. That was about seven years ago and Spain became my home. I ended up moving up to the northeast region of Catalonia and this is where I've developed myself. It feels like your baby or something. I always say these routes are kinda like sculptures when you finally bolt them and you can see chalk up the wall. Of course, this rock has already been there for thousands of years but somehow we bring this new interaction to it. It becomes a piece of art. It's no longer just some random piece of stone. The big obstacle is finding these next level routes because everything has to come together perfect when you’re climbing at your maximum level. You have to find something that’s just at the right difficulty but that’s also really beautiful. Because you can find any two-metre section that might have a really hard move on it, and maybe you can find a 9b or something like that. But really, the challenge is to find something that is beautiful and inspiring—you know, like a masterpiece, a work of art. When I'm trying just to get in shape, I'll climb a lot every single day. But then you also have to be really strategic and rest enough and recover so that you can give 100 percent when you need to. So I never structure my training, but there are definitely moments when you're stronger and weaker, so it's good if you can time it so that when you're stronger you can take advantage of that.